Red light can't penetrate far past the ocean's surface, so researchers thought that most fish don't perceive red light. But some reef fish have taken advantage of the absence of red light, using it to communicate without attracting the attention of their predators. Once you pass the first 10 to 20 meters of seawater, most of the red and orange sunlight is filtered out. In all but the shallowest waters, red fish would simply appear dark grey. As a result, biologists have found that most reef fish are sensitive to short and medium wavelengths of light (those in the green to violet range), and usually unaware of long wavelengths of light (in the orange to red range). But not all light in the sea comes through reflection of sunlight. Some marine critters generate their own light. They absorb short-wavelength light (blue) and re-emit photons of light at longer wavelengths. As a result, fluorescent fish can appear red even in an environment where the corresponding wavelengths of sunlight are entirely absent. Since animals so often communicate using their bodies, it is possible that animals who change their coloration can generate surprising colors in order to appear more conspicuous, to make them stand out against the background. Indeed, recent research has revealed that more than 180 types of fish can glow red. In other animals, like parrots, spiders, and mantis shrimp, fluorescence is used to communicate. It's a visual signal, a behavioral response to something in the environment. It's perhaps used to attract mates or to ward off competitors or to deter predators from gobbling them up. But no research has yet looked at the role of red fluorescence in fish. Now, University of Tubingen researcher Tobias Gerlach and colleagues wanted to find out why Indo-Pacific reef fish called fairy wrasses (Cirrhilabrus solorensis) glow red. The male fairy wrasse, photographed in normal white light (above) and in blue light (below). Gerlach acquired his fish from within the aquarium trade, so that he would not have to harvest fish from the wild. Each fish – all adult males – was kept in its own tank, under constant blue light, to mimic the reef environment. To see how the males would respond to other males, the researchers used a reflective glass mirror. Reef fish such as fairy wrasses aren't capable of identifying the fish in the mirror as their own reflection; instead, they treat it as another individual, a possible competitor. To control the image that the fish saw in its reflection, the researchers covered the mirror with various filters to control which colors were permitted to pass through it. When the mirror fish was stripped of all red coloration, the fish didn't seem to mind them very much. It was mostly when they perceived the red light that they reacted aggressively to the fish in the mirror. They tried to bite it and slap it with their tails. Why does a glowing red fish provoke an aggressive response? 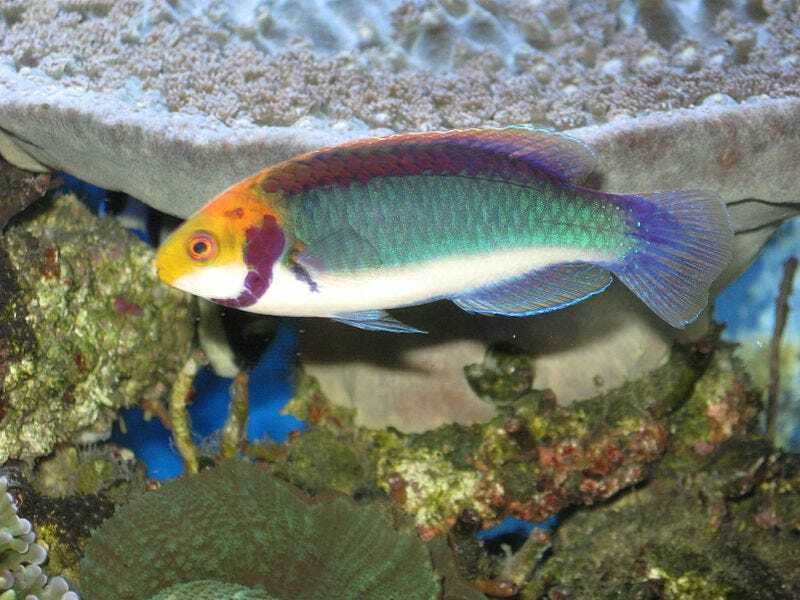 It could be that fluorescent coloration allows male fairy wrasses to recognize each other, the way that the more typical reflective coloration in other fish does. The male fairy wrasse, photographed in blue light (above) and in blue light with red filtered out (below). It's not that the fish never reacted aggressively to mirror fish who lacked the red coloration, only less so. It could be that the fish still perceived the mirror fish as an intruder, but one of less importance. Fairy wrasses have an unusual life cycle, in which all individuals start as females and transition into becoming males. While the transition-stage wrasses begin to look like males in terms of their anatomy, it takes a while before their coloration catches up. "A red-deprived mirror image may therefore be perceived as a transitional male that is not yet judged as a fully competent rival, and thus receives only limited attention by territorial males," reasons Gerlach. Whether females also rely on red fluorescence to identify possible mates is a question for future research. Still, none of thus explains why fairy wrasses glow red as opposed to any other color. That's where this story shows how clever evolution can be. It could be precisely because blue water is so bad at transmitting red light that it's so useful. That's because it allows reef fishes to communicate to each other at short distances to support sexual or social interactions, while remaining inconspicuous to predators lurking farther away. "We propose that [the fairy wrasse] may have shifted its visual communication towards wavelengths that predatory fish are less likely to pick up," writes Gerlach. By developing the unique ability to both perceive and generate the color red, some fish evolved the ability to shine brightly while remaining invisible to their predators. They use red light to transmit secret messages, leaving their enemies in the dark.